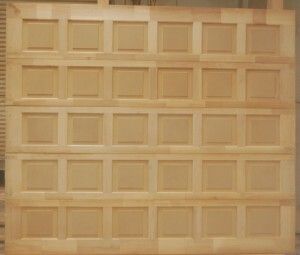 Ranch House Door full custom door line is the finest door construction Ranch house has to offer. The doors are carefully handcrafted to complement all architectural styles of your desires. 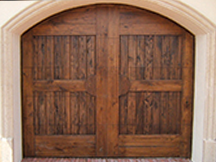 With the Full Custom line offered by Ranch House Door we use all fine woods like Western Red Cedar, Mahogany and many more. Ranch House Doors Semi-Custom Door is a classic Rail & Stile construction. The Shores Collection Series offers many designs and a great economic value. This mortise and tennon construction door comes insulated and has tru-divided lites and a 1/4” luan sheering system on back like the Full Custom Door. 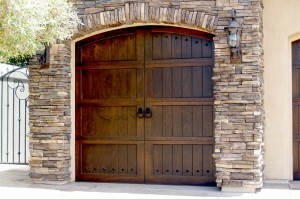 Ranch House Doors Elements Collection (Formerly “Fatezzi”) garage doors has faux wood claddings and are molded from real wood to replicate the intricate texture of natural wood. Ranch House Doors Faux wood garage doors bring together the best of natural woods beauty and proven polymer composite engineering. Ranch House Doors Rail & Stile door is the traditional raised or recessed panel doors Ranch House Doors offer this in Fine Stain Grade materials such as Hemlock, Mahogany, and Cedar. This Mortise and Tennon construction is built like the traditional entry door. Flush Collection garage doors offer a flat plywood face versions and a number of tongue and groove wood designs. Ranch House Door Flush garage door can soften the appearance and be a very elegant addition to your home. 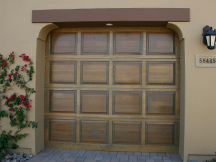 Garage door purists agree that there is nothing more authentic than a Ranch House Door Swing Out or Sliding garage door. These beautiful built doors take us back to the true carriage doors of yore. These classic designed and built doors are favorites among period and country home remodels. Our collection of garage doors at great prices. Doors in specific sizes, designs and materials.